With over two decades experience in the fragrance industry and a spotless reputation as a global distributor of prestige brands 3B International always have an eye on bringing their premium quality products into new markets. Recently, the company announced they are happy to announce the release of six of their popular English Laundry Fragrances in Saudi Arabia, to very high anticipation. With over two decades experience in the fragrance industry and a spotless reputation as a global distributor of prestige brands, 3B International always has an eye on bringing their premium quality products into new markets. Recently, the company announced the release of six of their popular English Laundry Fragrances in Saudi Arabia with very high anticipation. It’s well known that the Saudi Arabian people have a great love and affection for high quality fragrances for both men and women. This makes the news that a new line is being brought into the country very exciting for many people. That’s exactly what happened recently, with the announcement that a global marketer, manufacturer and distributor of prestige brands 3B International is launching six of their acclaimed English Laundry Fragrances in the kingdom. With over twenty years of experience in the fragrance industry, 3B International’s well known for its knowledge and ability in this competitive area. According to the company, the six fragrances available in Saudi Arabia will include, the following women’s fragrances: Notting Hill Femme- Tantalizing and Invigorating scent for the confident woman with notes of bergamot, mandarin, jasmine, vanilla and caramel; No. 7 for Her – Pretty and Enchanting, with a hint of pear, jasmine, melon, apricot, and toasted almond plus sandalwood, vanilla crème and musk; Signature for Her – Charming and Elegant, with quince, backed by white chocolate and jasmine petals, with notes of iris root, powdery musk and sensual woods. In addition, the following English Laundry men’s fragrances are also featured: Notting Hill EDP, presenting the Ultimate in culture and elegance, built for the professional, mature man, which many are calling a modern classic; Oxford Blue EDP, delivering a captivating and complex scent, the scent of revealing a distinctive bouquet of notes as its layers unfold; Cambridge Knight EDP, warm and classic, which offers the fragrance of effortless confidence made to suit the worldly man. English Laundry Fragrances are available internationally only through very top tier department stores, maintaining the brand’s very well developed reputation. Feedback from customers continues to be resoundingly positive. For more information on the company be sure to visit http://www.3binternational.com. 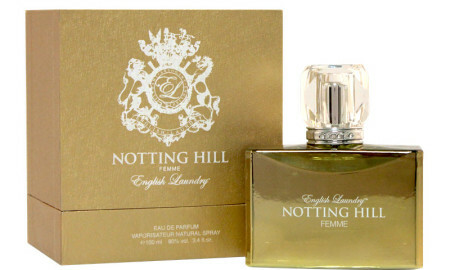 3B International Debuts Notting Hill Femme by English Laundry in Qatar!